The Turkish gozleme stall at the Addison road markets in Marrickville churns out perfectly cooked gozleme grilled to an exact goldenness with crisp dough and deliciously salty cheese filling. On lazy sundays, when I can’t be bothered cooking, I go there for lunch. I admire the women who run the stall (not sure why it’s only women, but it is). They gather around large tables with their white bakers caps and roll the dough hour after hour until finally, early in the afternoon, they run empty of dough and late comers miss out. The line for their stall is always long, and offers plenty of opportunity for crowd gazing, dog spotting, and child dodging fun. But this is not a post about their gozleme. This is a post on how to cheat when making your own gozleme; it’s a ‘I can’t be bothered going to the markets and lining up and fighting the crowds’ kind of recipe, and ‘I don’t want to be stuck in the kitchen all afternoon’ kind of recipe. Some times short cuts are necessary, right? Some times there’s not enough hours in the day to get every thing done. Some times you have to cheat! You will need to buy a good Pita bread. I get a Greek one that I’m fond of. It fries well and has a nice taste. 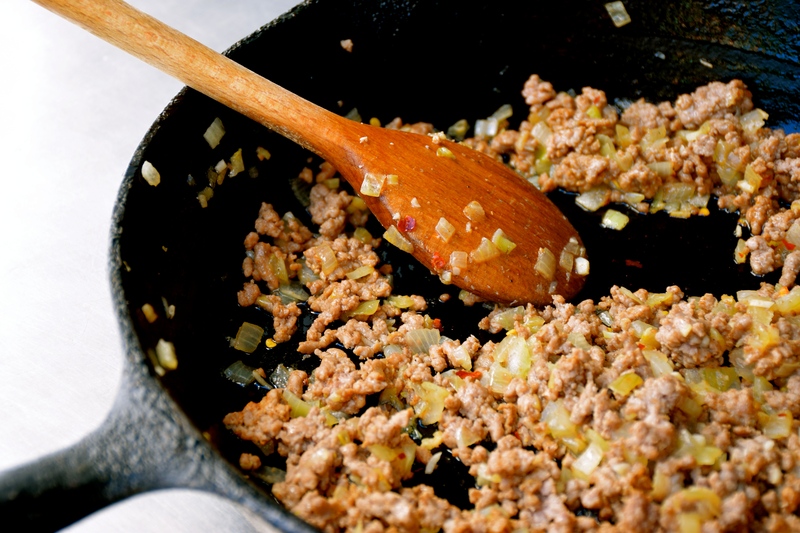 Next, you need some free range lamb mince (if you’re going to cheat, you might as well cheat in style). I go to my local butcher and buy it from there because they ground the mince while I wait, that to me is worth the extra dollars. A few simple spices, cinnamon, cumin, and a pinch of chilli, (my kids don’t even notice the chilli), onion and garlic, that’s it. Then you need a tasty, salty feta, and some washed, picked and sliced English spinach. Oh, don’t forget the lemon. This is for squeezing over the gozleme at the end, and lots of it. Unlike the talented Turkish women at the markets, who use a large barbecue style grill, you can take another short cut and fry it in a pan. This does require a lowish heat so as to not burn the pita bread before the spinach has a chance to wilt. And oil. You must use oil (I go for Rice bran or Grape seed). This will need to be brushed onto the pita bread before cooking, and again on the other side before flipping. A gentle hand is required so the filling doesn’t tumble out of the (cheats) gozleme as there’s no sides to fold over and hold the filling in. I won’t pretend that this is as good as a gozleme made from scratch, but for a cheats version, it comes pretty close! Heat a frypan with 1 tbsp oil, add the onion and garlic with a pinch of salt and cook gently for several minutes. Add the lamb mince and fry till cooked through. Add the spices and stir till fragrant. Remove from heat, set aside to cool. 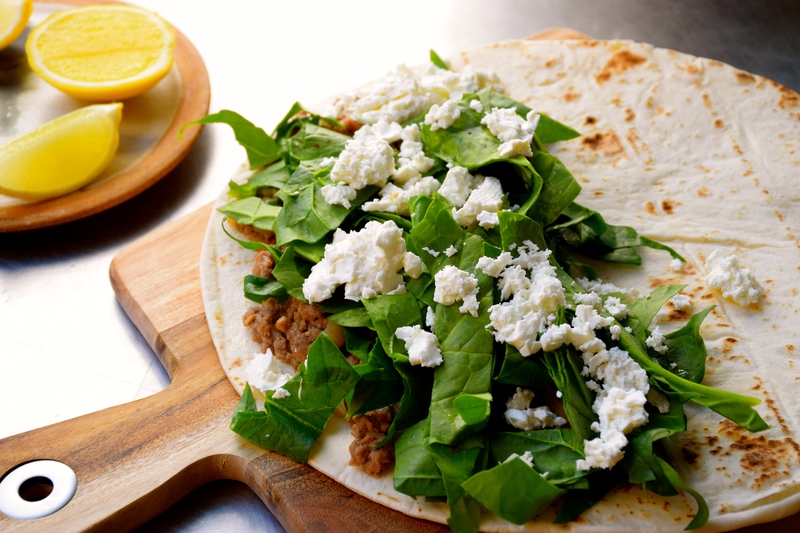 Lay out one Greek pita bread on a clean bench, place a quarter of the lamb mince on one half of the bread, sprinkle with 1 quarter of the washed, picked and sliced spinach, then crumble over the feta. Heat a non stick fry pan. Brush one side of the pita bread with oil, place the oiled side down into the warm pan, fry gently till golden. Before turning, brush the remaining side with oil and cook till golden, flip another time on each side. 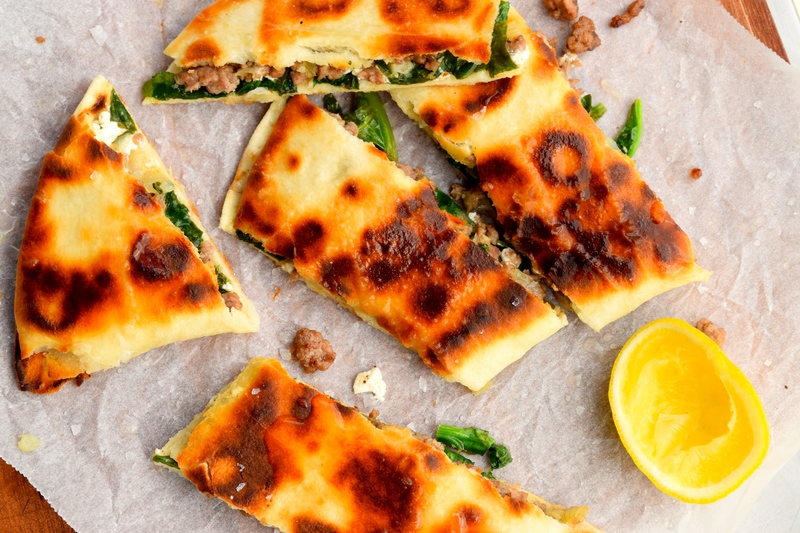 When the spinach is wilted and the feta melted, place gozleme on a board, and cut into 5 pieces. 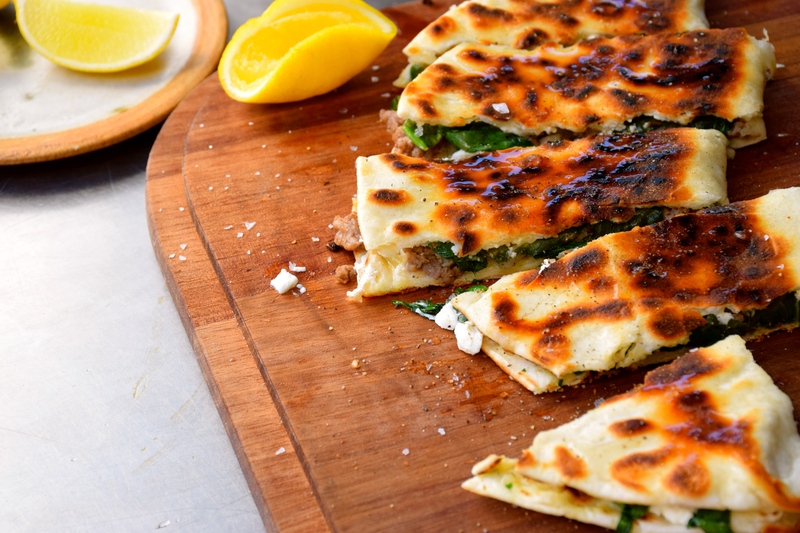 Sprinkle with sea salt, cracked pepper and squeeze a wedge of lemon over the gozleme; eat whilst hot and fresh. This looks absolutely wonderful. Beautiful photographs. Wonderful recipe. I’m looking forward to trying this in my kitchen. Think you’ll love this one Lindy. The pinch of cinnamon brings out the flavours in the lamb. Love this Michelle! I’m sure it was very tasty! Heh, it’s really good hangover food too. wow, damn delicious quicky gozleme!!! i guess i’ll add some mozza cheese in the filling too…. Yes, nothing beats a real gozleme but if you’re short on time this one will please.